For this reason, in order to develop Bokeh from a source checkout, you must first be able to build BokehJS. This chapter will walk you through getting a full development environment set up. The Bokeh source code is stored in a Git source control repository. The first step to working on Bokeh is to install Git on to your system. There are different ways to do this depending on whether, you are using Windows, OSX, or Linux. Developing Bokeh requires installing some software packages that are not Python packages (e.g. Selenium, NodeJS, etc.). To make this more manageable, core developers rely heavily on the conda package manager for the free Anaconda Python distribution. However, conda can also install non-Python package dependencies, which helps streamline Bokeh development greatly. It is strongly recommended that anyone developing Bokeh also use conda, and the remainder of the instructions will assume that conda is available. This will create a bokeh directory at your file system location. This bokeh directory is referred to as the source checkout for the remainder of this document. Bokeh requires many additional packages for development and testing. Many of these are on the main Anaconda default channel, but others are only available from additional conda channels, or via the Node Package Manager. If you do not wish to make configuration changes to your conda configuration, then the channels above can be added on a per-command basis with the -c command line option to conda, e.g. conda install -c bokeh -c conda-forge <pkgs>. Alternatively, add the channels to the current active conda environment with the --env flag. Note the required backticks in the command. The test category has been omitted from the Windows installs above because not all of the testing packages are easily installable on Windows yet. The commands above will install everything necessary to build and run, however. If you are interested in helping out and becoming a Windows maintainer for Bokeh, please contact the developers. If you do not wish to install globally (i.e. with -g) then all subsequent npm commands will need to be adjusted to use the local version installed under bokehjs/node_modules. This command will install the necessary packages into the node_modules subdirectory. Typically, these instructions only need to be followed once, when you are first getting set up. Occasionally, however, dependencies may be added or changed, in which case these instructions will need to be followed again. There are a few configurations you can make locally that will help make working with the repository safer and easier. The optional instructions in this section are specific to OSX and Linux. In order to help prevent some accidental errors, here are some git hooks that may be useful. The scripts below should be placed in the .git/hooks subdirectory in the top level of the source checkout directory and be marked executable with e.g. chmod +x pre-commit. For more information on git hooks, see this turorial. This git hook runs all the codebase tests before allowing a commit to proceed. Note that all the standard testing dependencies must be installed in order for this hook to function. This git hook prevents accidental pushes to master on GitHub. There are also some useful aliases that can be added to the .gitconfig file located in your home directory. The following alias adds a git resolve command that will automatically open up your editor to resolve any merge conflicts. You can replace vim with whatever your favorite editor command is. Once you have all the required depencies installed, the simplest way to build and install Bokeh and BokehJS is to use the setup.py script at the top level of the source checkout directory. Bokeh will be installed in your Python site-packages directory. In this mode, any changes to the python source code will not show up until setup.py install is run again. Bokeh will be installed to refer to the source directory. Any changes you make to the python source code will be available immediately without any additional steps. You may skip this prompt by supplying the appropriate command line option to setup.py, e.g. Note that you will need to build BokehJS any time that the BokehJS source code changes (either by you or by pulling new revisions from GitHub). In particular, at the very least, you must build BokehJS the first time you install. It’s also possible to configue the download location, or to start the download programmatically. 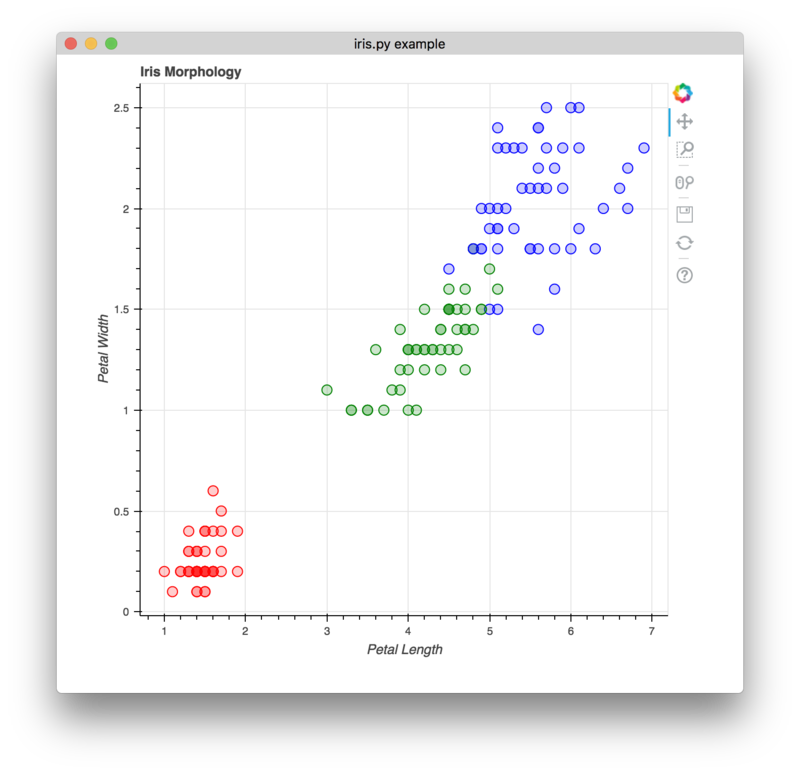 For full details see the Sample Data section of the User’s Guide. The next check that can be made is to run some of the examples. There are different ways in which bokeh can be used which suit a variety of use cases. which will create a file iris.html locally and open up a web browser. which will open up a browser with an interactive figure. 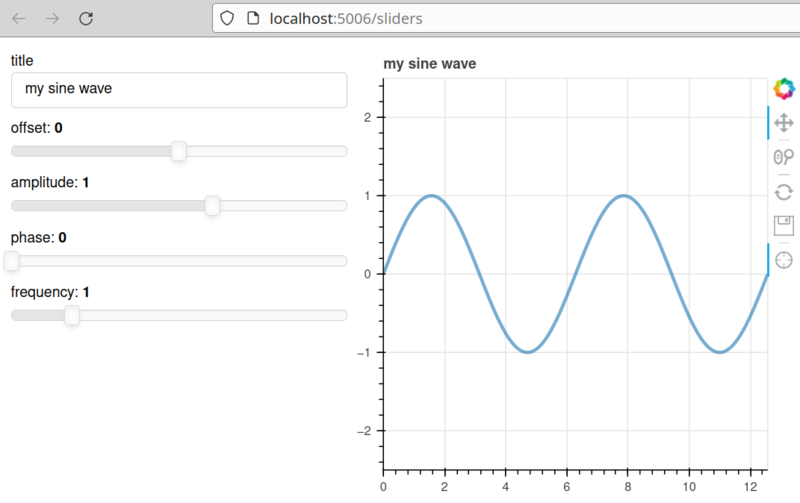 All the sliders allow interactive control of the sine wave, with each update redrawing the line with the new parameters. The --show option opens the web browser to the appropriate address, the default is localhost:5006.